The environmental “carrots” for balking car drivers are here now: Granville Island has more active transportation options. Different approaches to transportation during the Olympics on Granville Island, have been well underway for the past month before the official Games start on Feb. 12, 2010. 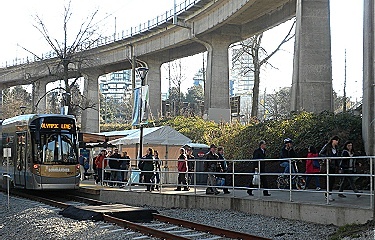 The Olympic streetcar line between the Canada Line Olympic Village Station and Granville Island, already has a steady stream of passengers. After all, it is free for anyone 6:30 am – 12:30 am, Jan. 21 – Mar. 21, 2010. My informal observations of the pedestrian traffic from the streetcar onto the Island appear to be at least 30 to 50 people getting off each streetcar. Even on Mondays. Streetcar capacity is for 178 people with 50 seated passengers. Passenger demand is expected to increase during the Olympics, particularily with 3 welcome pavilions for the public –Atlantic House, Francophonie and Swiss House on Granville Island in addition to regular market business. Now paid parking is in effect as of Feb. 8 for 1,200 parking spots. Rates are $3.00 per hour and $5.00 for two hours, with a parking maximum of two hours. Free car parking is only before 10:00 am during Feb. 2010. 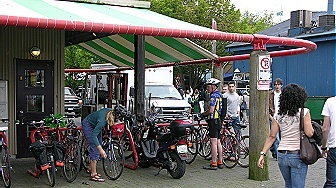 Also the number of bicycle racks around Granville Market have increased from 5 to 10. I have observed from mid-morning onward, rack usage has increased to summer levels. Both ferry shuttle companies, Aquabus and False Creek Ferries, have extended their operational hours during the Olympics. Each company has slightly different hours for different destinations. 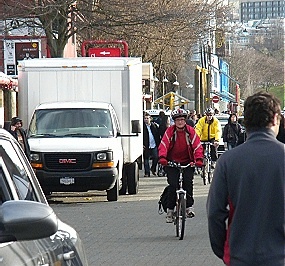 The big question will be whether or not the streetcar line and more bike parking, will generate sufficient traffic to off-set normal car volumes on Granville Island. It may take time for local residents to rethink and change their normal transportation modes long after the Olympics and ParaOlympics. Will Vancouverites fall in love with the streetcar line that they will want to keep the streetcar in operation indefinitely?